The weather here in the North of England has just been crazy these last few weeks. When we go out we take everything from rain coats and rain covers to suncream and sun hats as we never know what’s going to happen next. This hasn’t stopped us having adventures though and I’m now Forest Childcare provider so committed to getting the Tots out whatever the weather. Yesterday I just had Jack during the day and he had a lot of fun exploring this lemon scented Summer Sensory Bin by himself. It’s been going strong for a week now and still smells amazing! My favourite from last week was this Five Ways to Paint with Toddlers from So We Did. Such fun to use something other than a paintbrush and the results are beautiful. If you are a blogger we want to see your posts (and you insta pics!!) 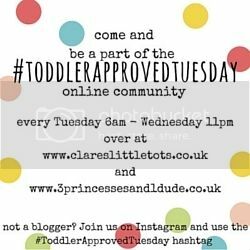 If you are a mum, carer, grandparent or Early Years worker we want to see your photos on Instagram and Twitter, you can join in by using the hashtag #ToddlerApprovedTuesday and we will repost a couple each week. You can use the hashtag as many times as you like! We would love it to become one of your regular hashtags!